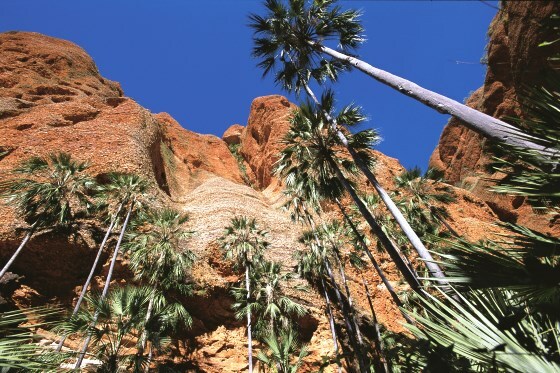 Rising impressively out of the Ord River Valley in the remote East Kimberly wilderness, the Bungle Bungle Range is the most outstanding example of cone kast sandstone mountains anywhere on earth. 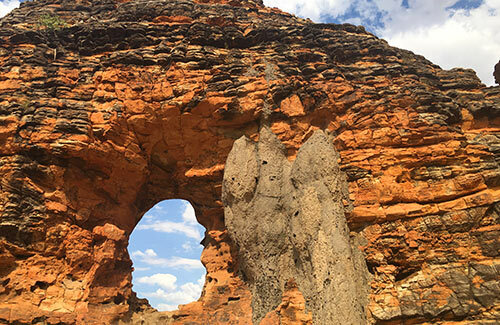 The World Heritage Purnunulu National Park offers a unique trekking experience as we journey deep into the magnificent sandstone gorges of the central mountain range of the Bungles. 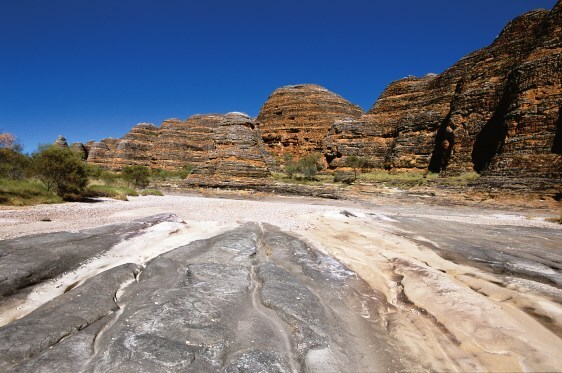 The local Aboriginal people of this rocky outpost – which borders the great deserts to the south – have a deep connection with the gorges and creek systems, which cut spectacularly through the landscape. There are significant burial and art sites scattered throughout the park and our trek itinerary and guides are sensitive to these special places. 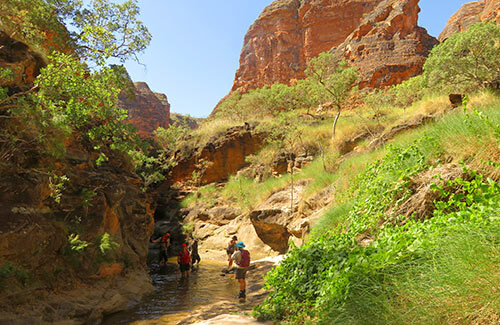 Our trek takes us into Piccaninny Gorge, located geographically in the centre of the Bungle Bungle Ranges. 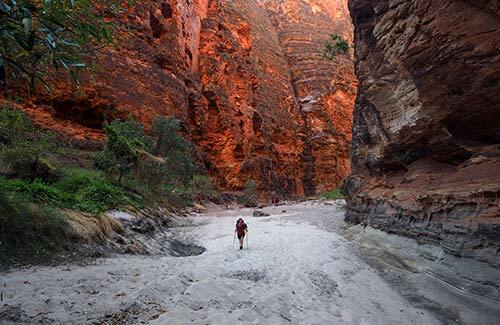 We establish a basecamp enabling our group to explore the extensive sandstone chasms of the Five Fingers, located beyond the imposing sheer cliffs of Piccaninny Gorge. The trekking here is unmarked and exploratory in nature; we spend three full days exploring the wonders of the secluded and sheltered micro-habitats of the Fingers. Our five night adventure allows us to experience the unique wonder of this ancient land. This is an unparalleled trekking adventure of a lifetime. 5 breakfasts, 5 lunches and 5 dinners. All delicious snacks on the trail. 2 experienced professional wilderness guides. All national park permits and camping fees. All camping equipment including mosquito dome, sleeping mat and sleeping bag. All catering equipment including cutlery, cups, plates, bowls. Group emergency satellite communication/navigation equipment. Group wilderness first aid equipment and supplies. 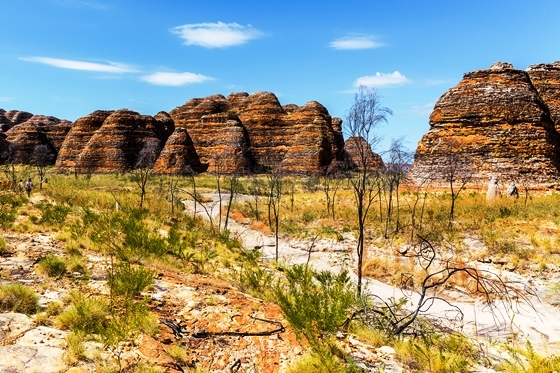 Return flights from Kununurra to Purnunulu National Park. This is a small group off-track trek for experienced hikers with a maximum of 10 people. 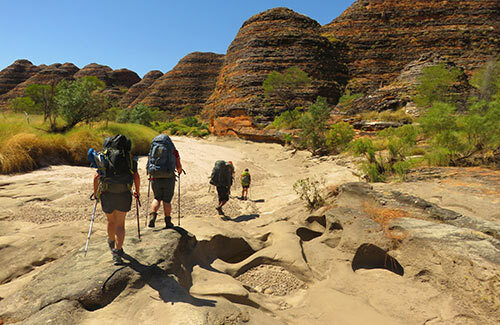 Our 6 day Bungle Bungle trek is a demanding hike, we advise you to do as much training as you can before your adventure with us. The more you train for this trek the easier you will handle the terrain and the more you will enjoy this wonderful part of the world. It’s also important to come along with an open mind ready for an awesome experience whatever the weather, whoever the group. We need to stress that this is a demanding hike – there is no vehicle support once you have been dropped at the start, and you need to feel confident carrying a full pack weighing up to 20kg. The other factor is the heat – while we try to walk in the coolest parts of the day, you need to be prepared for temperatures in the high 20s/low 30s. It is very important that you bring the right gear for the conditions. A comprehensive gear list is included at the end of the itinerary. Quality backpacks are available for hire. If you are at all concerned about your ability to do this walk, please feel free to call one of us here at Trek Tours Australia for more advice. The terrain experienced on this trek is a mix of trekking through sandy creek beds, climbing over large boulders, wading through cold waters and squeezing & climbing through tight spaces. Minimal Impact trekking techniques are used in sensitive areas and certain route options are determined by local conditions and hazards. Note: This itinerary is subject to change with any change in Community regulations as well as Governmental changes and natural circumstances beyond our control. You will be required to carry all your equipment in a full trekking pack, that is 70-90 litres in capacity. This includes sleeping bag, inflatable sleeping mat, mosquito dome, a proportion of the group’s food supplies and all personal items as specified in our gear list. Depending on the quality and quantity of personal gear and toiletries, your pack may weigh up to 20kg. A comprehensive gear list is available on the downloadable itinerary and details what equipment is included in the tour cost, what items are available for hire and what you will need to bring with you. A pre-trip briefing and a full gear check with your guides the afternoon before your Bungle Bungle trek departs will ensure you have the right mix of gear for your adventure – this will be held at 3pm at Celebrity Tree Park (opposite the entrance to Kimberleyland Holiday Park on Old Darwin Road). Please bring your pack and the gear you intend to take on the trek. 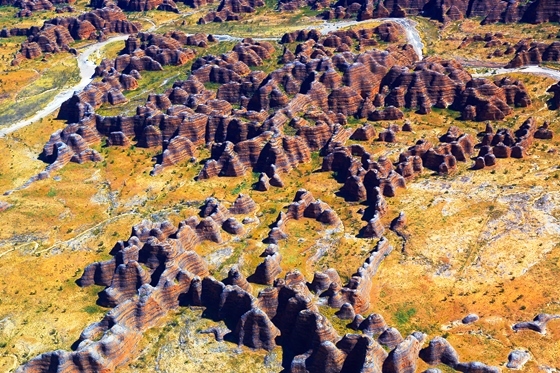 We completed the 6 day 5 night Bungles adventure with Trek Tours Australia with extremely experienced guides. This is a must do. This was our 6th hike with Trek Tours and I would highly recommend that you go. The guides are very knowledgeable and we have total trust in them to get us home safely. The guides are great people that make us all feel like part of the Trek Tours Australia family. Just get out in the great outdoors! At Trek Tours Australia we strongly believe in the value of travel insurance. We want to help make insurance more affordable by offering you a 10% discount. Use this discount for Trek Tours Australia treks and other travel you do anywhere in the world. Travel Insurance is underwritten by QBE Insurance (Australia) Limited ABN 78 003 191 035. A Product Disclosure Statement should be considered before acquiring this product.